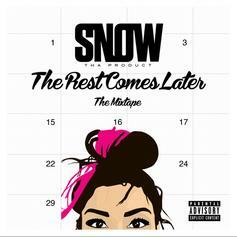 Cop Snow Tha Product's new mixtape "The Rest Comes Later". The second instalment in Snow Tha Product's "Good Nights & Bad Mornings" series, featuring guest appearances from Tech N9ne, Ty Dolla $ign, Dizzy Wright, Trae The Truth, Cyhi The Prynce, Riff Raff and more, with production from Cardo, ID Labs, Sap, Sunny Dukes and others. Enjoy.